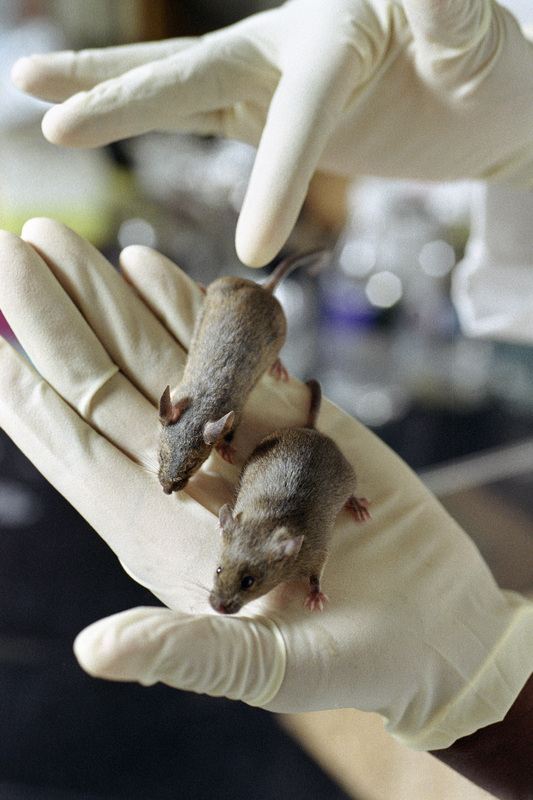 Caption: Professor of biochemistry and nutritional sciences James Ntambi holds two mice in his research lab and points to the mouse that is missing a SCD-1 gene and is significantly thinner than the normal mouse at right. Ntambi recently found that subracting a single gene, SCD-1, from the genome of a mouse creates an animal that can eat a rich, high-fat diet without gaining weight or risking the complications of diabetes. MADISON - An engineered mouse, already known to be immune to the weight gain ramifications of a high-calorie, high-fat diet, now seems able to resist the onset of diabetes. The mouse, stripped of a gene known as SCD-1, is apparently impervious to the negative effects of the type of diet that, for many people, has significant health and social consequences. "We think this animal model may be protected against diabetes," says James Ntambi, a University of Wisconsin-Madison professor of biochemistry and Steenbock professor of nutrition, and the senior author of a report describing the remarkable mouse in this week's (Sept. 1) online editions of the Proceedings of the National Academy of Sciences (PNAS). The new finding is important because it provides critical genetic and biochemical clues to diet, obesity and the onset of a disease that affects as much as 6 percent of the U.S. population. Type II diabetes, which accounts for about 90 percent of the incidence of diabetes in the United States, is a chronic disease caused by a problem in the way the body makes or uses insulin. Insulin is a hormone secreted by the pancreas that, under healthy circumstances, plays an essential role in moving glucose from blood to cells where the sugar's energy is expended. In many instances, obesity and diabetes go hand in hand. Between 75 and 80 percent of people with type II diabetes are obese, although the disease can also develop in lean people, especially the elderly. The discovery of a gene that seems to exercise significant influence over both weight gain and glucose regulation promises a potentially significant window into both conditions and their relationship. The gene makes an enzyme called SCD. It affects the production of fatty acids, and because humans have SCD-1 equivalents, the new finding helps explain why some people, who may lack the gene, remain lean and diabetes free, despite a rich, fatty diet. "We are beginning to suspect that obese individuals have increased expression of this enzyme," says Ntambi. "If you reduce expression of this enzyme, you reduce fat expression in muscle." This new insight into the gene and its influence could herald the development of new drugs to prevent both diabetes and obesity as it may help scientists zero in on the underlying problems that lead to both conditions. In the engineered mice, the Wisconsin team observed that muscle cells were more sensitive to insulin, enabling the cells to absorb glucose and avoid hyperglycemia. Elevated levels of glucose in the blood prompt the pancreas to produce more insulin, which tends to make cells even more resistant to the critical hormone. "In this animal, there is increased insulin signaling or sensitivity," Ntambi explains. "When insulin binds to the cell's insulin receptor, it triggers a cascade of events " that enables the animal to successfully regulate levels of blood sugar. "There are lots of steps involved in the process, and in the case of type II diabetes things go wrong in some of those events," Ntambi says. "What we found in these animals is that the insulin signaling steps in muscle are all enhanced, despite low levels of insulin in plasma. We don't see a defect yet." The work by the Wisconsin team was funded primarily by the National Institutes of Health and in part by a grant from Xenon Genetics, Inc. In addition to Ntambi, co-authors of the PNAS report include Shaikh Mizanoor Rahman, Agnieszka Dobrzyn, Pawel Dobrzyn, Seong-Ho Lee and Makoto Miyazaki. National Institutes of Health, Xenon Genetics, Inc.